It’s likely that half of your life will be spent at work, so makeup for the office should be paid special attention. The way we look depends on the impression we have on others and your own mood is much better if you look good. What should office makeup include? Despite the apparent simplicity, office makeup is not so simple to do. Some people do not use cosmetics at the office, justifying this choice by pointing out their lack of free time or principles— they say that at work we have to work, not to shine in appearance. Others, on the contrary, want to surprise others with bright and creative makeup. The challenge is to find a middle ground between these two points of view. It is necessary to look stylish and well-groomed but, at the same time, low-key and not vulgar. The main features of proper office makeup are natural. Do not use bright colors, giving colleagues a reason to discuss your red lipstick or noticeable blush. Choose natural, calm tones. Instead of black eyeliner, go with gray or brown. Black mascara is acceptable, but let it be simple without any flashy effects. No black eyeshadows, brick-red lipstick, or blush. Choose colors that are pleasing to the eye, blend harmoniously with each other, and are suited to your natural features. Your best friends should be beige, brown, gray, olive, pale pink, etc. The key to success for office makeup is skin care. The skin should be cleaned regularly and toned. Do not forget about the cream for your face, including the skin around the eyes. Be sure to wash off all makeup at night—your skin will be grateful to you and it will not take long. To improve the appearance of the skin and disguise flaws use friable powder or light creams to avoid clogging pores. Color tone must match the natural color of the skin; otherwise you will get the appearance of a "mask" on the face and it will look strange. The more inconspicuous the foundation, the better your overall look will be. If done correctly, office makeup can covertly create a favorable impression on you! 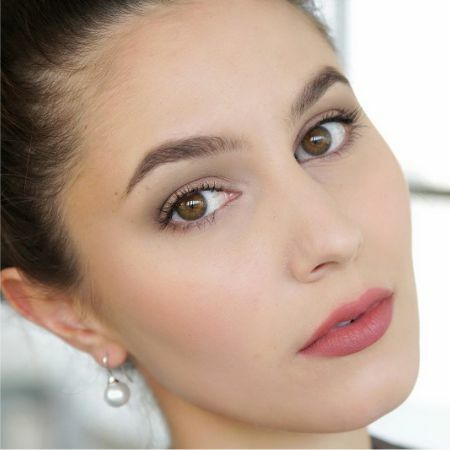 Like the article «Office Makeup»? Share it with friends!